New customers only. 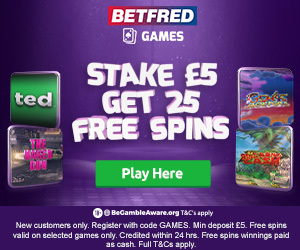 Register with code GAMES then deposit and stake £5 or more to receive 25 Free Spins on selected games. Free Spins credited within 24 hours. Free spin equal to 20p per spin. The 25 free spins are only available on games Genie Jackpots, King Kong Cash, The Naked Gun or Ted. Any winnings from free spins will be paid as cash. No wagering requirements applicable to free spins.